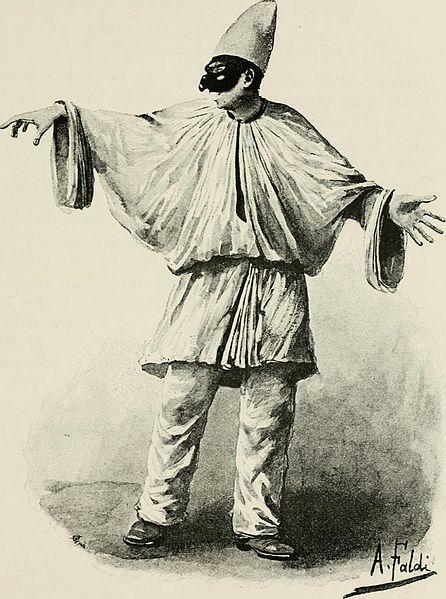 Credit Arturo Faldi, 1892 "The Humor of Italy"
It’s good to have you back for day two of Puppet Week on Kids Commute from Interlochen Public Radio. This week, we’re enjoying music written about puppets. Yesterday we shared “Loutky” by Bohuslav Martinu, and introduced you to a new Kids Commute Quizlet. Did you know the correct answer? If you didn’t get it yesterday, don’t worry. We’ll give you a hint in today’s episode. KC 281 - PUPPET WEEK! Tuesday: Today, we'll hear "Fantoches (Puppets)" from "Fetes Galantes" by the French composer, Claude Debussy. Today, we get to hear “Fantoches (Puppets) - Fêtes Galantes (Gallant Parties)”, written by French composer Claude Debussy. We’ll also learn about characters in puppet shows. And, by the way, we’ll reveal to you what a Scaramouche is. It might help you understand lyrics from the popular rock band Queen. Join us for Kids Commute - music appreciation for kids from Interlochen Public Radio! Welcome to Puppet Week on Kids Commute - music appreciation for kids from Interlochen Public Radio! Join us as we listen through music written for and about puppets. This week we’ll highlight fun compositions by Charles Gounod, Igor Stravinsky, and more! Today’s musical selection is “Loutky” or “Puppets”, composed by Czechoslovakian composer, Bohuslav Martinu. KC 280 - Puppet Week! Monday: Today, we'll hear "The Sentimental Puppet", a piano piece by Czech composer Bohuslav Martinu. Hooray for Friday! It’s the final day of the school week, and the final day of “Dolly Week” on Kids Commute from Interlochen Public Radio. All week long, we’ve been hearing selections from the six movement suite composed by French composer Gabriel Fauré in the 1890s. KC 279 - DOLLY WEEK! Friday: Today, we'll hear the lively Spanish dance that makes up the finale of the "Dolly" Suite by Gabriel Fauré!